If you have a ticket for an event that you don’t need, what are allowed to do with it? What are the rules and regulations regarding reselling tickets? There are two main breeds of seller operating within the secondary ticket market; those who sell on their ticket because they can’t make the event, and those that do it purely to make money. Apart from with football matches, no laws have been imposed on reselling event tickets. It is claimed this is to protect the former seller, but in doing so has created a flourishing and damaging market for the latter. Many fans are angry that they are being pushed out of the official ticket marketplace, because so many are snapped up in minutes by non-fan touts looking to sell them on at two or three times their face value. Alarming research has shown that if you attend a concert by a superstar act, such as U2 or Madonna, then there is a one in four chance that you bought your ticket from a tout. Some promoters estimate that up a third of tickets are resold. At present then, if you have an event ticket that you don’t want to use, you are legally allowed to sell it on for whatever price you see fit. If your morals are not troubled by the idea of exploiting a fan, then you can legitimately sell it on eBay, viagogo, Gumtree.com or other such touting sites for a higher price. If, however, you feel that it is only right that you sell it to somebody for the same price that you paid, then one option is to visit the ethical ticket-exchange site Scarlet Mist. Reselling tickets may still be lawful practise but that doesn’t mean event organisers are simply accepting their tickets being sold on at a profit. Many have started to impose their own buying restrictions to try and curb the problem themselves. Despite the absence of regulation, the event organiser does at least have the power to not honour resold tickets. Many organisers are also choosing to impose limits on the number of tickets one person can buy. At certain big events the tickets are being issued with the owner’s name on, and can only be used by a person with corresponding I.D. In 2007 the Glastonbury Festival, for example, continued its public fight against touts by issuing its tickets with the holder’s photograph on. MPs have nevertheless criticised event organisers and promoters for helping to feed the black market by failing to provide an adequate returns facility. Ticket agencies will usually only accept returned tickets or refunds if the event has been cancelled or the date or venue been significantly changed. However, the blame for aiding and abetting the secondary marketplace and its ‘bedroom touts’ has largely been assigned to the auction sites like eBay and Viagogo. Not only do they provide a facility for buying and selling those sought-after tickets, but also one that is relatively safe and secure. Banning ticket resale does not necessarily solve the problem. 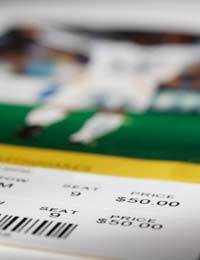 Ticket touting is reportedly rife within football, despite being subject to a law banning reselling tickets since 1994. As a result the Football Association has been pushing for stronger legislation and better enforcement of the anti-touting laws. The ticket agency Viagogo has arranged controversial deals with both Chelsea and Manchester United to allow fans to sell on unwanted tickets to football games.